Ride the beautiful quiet country back roads of Marin county from Lucas Valley up to Big Rock before descending through the redwoods out to Nicasio. Climb up Rocky Hill on Pt Reyes Petaluma Rd for the drop through Hicks Valley. Continue along the top of the ridge on Wilson Hill Rd and enjoy the scenic roll through the gorgeous Chileno Valley to Tomales Petaluma Rd. The return includes a fabulous roll on Hwy 1 along the gorgeous shoreline of Tomales Bay to Pt Reyes Station. Lucas Valley begins on flat-rolling terrain for the first 3.5 miles along the valley floor. The road tilts up for the climb up to the Big Rock summit; it’s one mile with an average grade of 7.2%. Lucas Valley drops down into the valley through the gorgeous redwoods to the ranches and grasslands of West Marin. Nicasio Valley Rd to Nicasio Square. Nicasio Valley Rd runs 3.3 miles along the reservoir out to the open valley to Pt Reyes Petaluma Rd. Head NE on Pt Reyes Petaluma Rd; the climb up Rocky Hill begins at the Clover Organic Farm sign; it’s 0.6 mile with an average grade of 7%. Descend Pt Reyes Petaluma Rd into the valley towards the Marin French Cheese Factory. The road continues through the gorgeous Hicks Valley with fantastic views of Hicks Mountain and its surrounding open grasslands, meadows and agricultural farmlands. Hicks Valley Rd leads out through the valley pass the historic Lincoln School to the vineyards and ranchlands around Red Hill Ranch to the short climb up Hammock Hill. The turn on Wilson Hill Rd takes you along the top of the ridge around Antonio Mountain; it’s a steep 0.7 mile climb with gradient ranges of 10-12%! Enjoy the stunning valley views! The descent on Wilson Hill into Chileno Valley is crazy fast-use caution! Chileno Valley Rd is a beautiful quiet country back road with minimal to no traffic. The 9.6 miles of rolling terrain on this popular cycling road leads you through the scenic Laguna Lake, soft golden hillsides, open fields and grasslands of the surrounding cattle ranches and farms. Climb out of Chileno valley to Tomales Petaluma Rd. Head west on Tomales Petaluma Rd for the next 5.2 miles; the rolling climbs take you through the expansive open valley meadows and pastoral ranch lands towards Tomales. The turn on CA-1 N leads into the town of Tomales. Exit town on CA-1 S on the flatlands along Keys Creek to the south end at Preston Point . The waterway opens up to Walker Creek into Tomales Bay. The rolling climbs on CA-1 S leads out along Tomales Bay through the small communities along Hamlet and Nicks Cove. CA-1 S continues rolling along Tomales Bay with fabulous views of the shoreline and inland hills. CA-1 S drops down onto the flats through the town of Marshall. 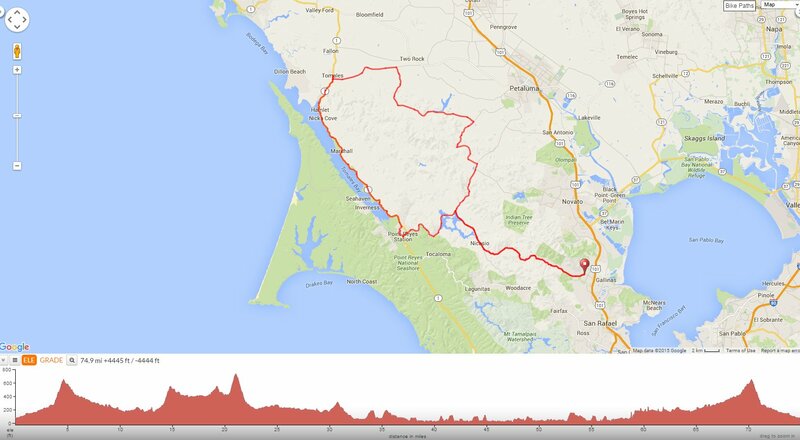 The rolling terrain on CA-1 S continues winding around the bay to the short steep climb up towards Pt Reyes Vineyards. Stay on CA-1 S along the open meadows around Tomales Bay State Park to Mesa Rd. Mesa Rd leads you through a quiet residential neighborhood in Pt Reyes Station to the Bovine Bakery. The short climb out of Pt Reyes Station on CA-1 N takes you onto Pt Reyes Petaluma Rd. The descending terrain has one short climb up towards Black Mountain Ranch and gently flattens out all the way towards the stop sign at the colored bridge. Stay on Pt Reyes Petaluma Rd for the Spillway climb up to Nicasio Reservoir; it’s 0.5 mile with an average grade of 4.6%. Continue along the flats around the reservoir to Nicasio Valley Rd. Take Nicasio Valley Rd to Nicasio. Stay on Nicasio Valley Rd to Lucas Valley Rd. Return through the beautiful redwoods on Lucas valley Rd. Gentle mile long climb to Big Rock summit. The descent from Big Rock on Lucas Valley Rd requires much caution; there are several very sharp left hand turns with decreasing radius! The run down Lucas Valley Rd finishes off with a fun flat stretch back to Miller Creek Rd. This is a beautiful route around the quiet country back roads of Marin County. You’ll enjoy the ridge top views on Wilson Hill and ride through the expansive valley meadows and pastoral lands along Chileno Valley Rd. The run along Tomales Bay on CA-1 S from Tomales to Pt Reyes Station is spectacular! Weather: Sunny and cool with clear blue skies. Temps ranged from the mid 30’s to the low 60’s with NW winds. Really great pics of a favorite ride. Thanks, Nancy. Jim, You’re welcome-see you out on the roads! Michael & Maydene, It’s always my pleasure! Enjoy the upcoming holiday season!